The coalition for Palestinian children in Israeli detention has printed a new edition of the postcard with recent statistics regarding children detention. 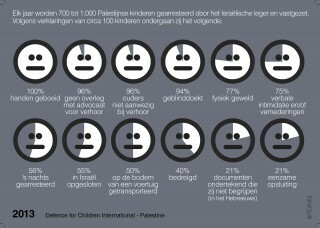 Both the Netherlands and Israel have ratified the Convention on the Rights of the Child. Due to that the Netherlands has the obligation to see that Israel will live to its standards. Therefore the coalition is urging the new Dutch foreign minister Bert Koenders to be actively involved in this topic and demand from the Israeli government to respect the rights of these children.